World globe with luster and shine. The evolution of this contemporary globe moves us unto the 21st century. It offers a 12" diameter lustrous Blue Ocean earth globe on a brushed steel inclination bracket, cone and base. The easy to read map offers larger place names and utilizes multiple colors. 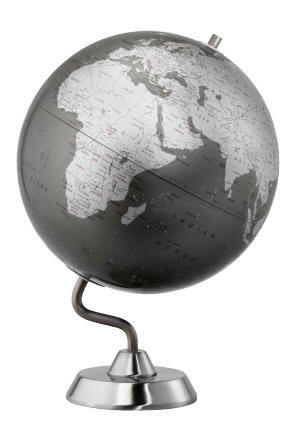 This contemporary globe will display museum like quality in your home or office.